Tips on living aboard and cruising. fact is, a 'dream boat" is (most often than not) a dream buster. Microwave, cellphone, etc. Long distance voyagers today no longer have to live like cave men. Instead, most boats are more like "man caves". creature comforts for a weekend than it is for months or a year. dinghy is a must have in our book. When you're "out here" on the water, a new boat warranty won't do you any good. Good tools and spare parts are better than money in the bank. need to know where you are, and where the nearest safest anchorage or marina is located. It's really that simple. the rising tide floats your boat again. Going aground on a falling tide however, can be disastrous. learn how to use it. This will prove to be better for a good nights sleep than any sleep number bed. neither should you. This is what (most often) gets sailors in real trouble. If you like a place, stay longer. If you don't like it, move on. (2012) I can't recall a single night without coverage. "things" to overcome. Don't wait until everything is perfect - it never will be! buying you time away from having to make money. It is NOT to buy you "stuff". Most likely, that "stuff" won't fit on your boat anyway. on your location, you can expect to pay $10.00 X the length of your boat, plus a reasonable utility hookup fee for keeping your boat at a Marina. both cases above, fees vary by region, location, and Marina. Cruising or not, it is critical that you remain in your comfort zone and maintain your lifestyle. For me, eating out, and good wine keeps me happy. carrots, onions, spices and fruit. As a result, what I eat on the boat is really "cheap eats" that go well both alone, or with the seafood I catch. the right size to make a meal for that day's dinner and have enough left over for the next day's lunch. you might not catch anything, or simply don't feel like fishing. to fit right in with "Military Intelligence" and "Jumbo Shrimp". . .
Because. . . 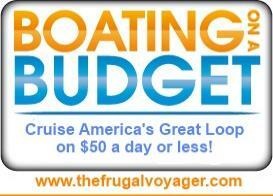 Fact is, it takes an awful lot of money to cruise on a frugal budget. impoverished circumstances or financial hardship. rescue, a haul out, and a major repair bill if neglected. displacement hull recreational Trawler or Tug boat. Otherwise, your cost of fuel can be a real budget buster. built and equipped for high demand electrical components. Keeping things simple means less work, less stress and less worry, as well as less expensive. That of course results in a happy voyager! boat and boat related expenses. enjoy seeing and doing ashore.